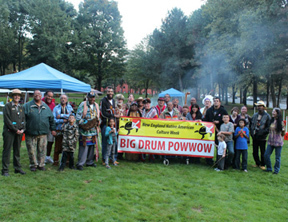 New England Native American Culture Week (NENACW) is a partnership between Rhode Island College (RIC); Eastern Medicine Cultural, LLC; Mount Hope Neighborhood Association, Inc; Rhode Island State Council on the Arts (RISCA); Roger Williams National Memorial; and MoonHawk Productions. It was started in 2009 by Ray Watson of the Eastern Medicine Singers. NENACW is a weeklong celebration that focuses on the Eastern Woodland Indian culture and traditions. Panel discussions, film screenings and art exhibits, and annual Powwow are part of the NENACW events which are free and open to the public. For more information contact Raymond L. Watson at rwatson@ric.edu. May is national Asian-Pacific American Heritage Month, and each year Rhode Island College hostsan Asian-Pacific American Dance Festival and Community Leadership Awards event to celebrate Rhode Island’s Asian-Pacific community and leaders. 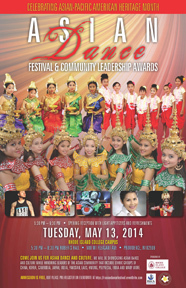 The most recent Asian-Pacific American Dance Showcase and Community Leadership Awards was held on Tuesday, May 13, 2014. Event sponsors include the Laotian Community Center of RI (LCC), Rhode Island State Council on the Arts (RISCA), and Rhode Island College (RIC). Dr. Nancy Carriuolo, President of Rhode Island College, welcomed audience members, community leaders, and performers in an awards event that preceded the evening dance concert. Leaders recognized included: James Viengkhone Phommasith, President of Lao Association of RI; Samnang Becker, President of Cambodian Society of RI; Subhash Chandler, President of India Museum and Heritage Society; Hiromi Lima, President of RI Japan Society, Language and Cultural Center; Director Luyi Shao of the Chinese RI Kung Fu Club; Co-Directors Chanravy Proeung and Sarath Suong of (PrYSM) Providence Student Youth Movement; Pastor Yee Heu of Hmong Evangelical Church of the Christian and Missionary Alliance; and Channavy Chhay, Executive Director of the Center for Southeast Asians. A rich and wide array of dance forms are celebrated in the dance festival ranging from Asian and Pacific classical and traditional forms to contemporary forms that blend Asian-Pacific Islander and western dance. Performers include the Cambodian Society Dancers; Master artist Song Heng and band; Laotian Dancers; Indian Association Dancers; Korean Dancers; Polynesian Dancers; and Everett Dancers.